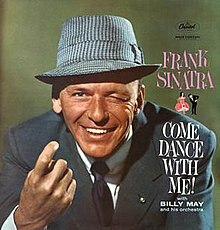 FRANK SINATRA: COME DANCE WITH ME: 1959: 5 STARS OUT OF 5 STARS: The 20th anniversary of Frank’s passing- continuing my Sinatra Capitol Records Marathon. In addition to the Sinatra albums in the evening I listened to three hours of the Sinatra station on SiriusXM- today was all-Frank all day. A good way to close two days of listening to The Chairman Of The Board. I haven’t listened to Sinatra in a long time. I recognize he was one of the great American entertainers and always liked his rendition of “My Way.” And who doesn’t start snipping their fingers to “New York, New York”? That being said, my music taste has since evolved, and he is now clearly outside my core wheel house.